Princess coloring book game is designed for kids to develop their coloring skills. Princess coloring book game is a coloring book game for kids with different princess pictures. There are unlimited color options. You may use bucket to fill color or brush to draw. You may use which ever picture by selecting on main screen to color. 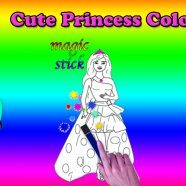 princess coloring book game is also compatible for tablets. Have fun with coloring, have fun with princess coloring book game.